​According to later chroniclers, if they can be believed, the adventure of Ibn Jubayr, one of the most illustrious rahhala, or travelers, from Al-Andalus to destinations throughout the Mediterranean and farther east, began in the year 1183 with a repugnant challenge. To name him in full, Abu al-Husayn Muhammad ibn Ahmad Ibn Jubayr al-Kinani served as secretary in the palace of Granada’s governor, Abu Said Osman, son of the first Almohad caliph, Abd al-Mu’min. As the story goes, at one point while dictating a letter, the prince coerced him to drink seven cups of wine, forbidden to Muslims. In exchange, the prince granted him seven cups of gold dinars. 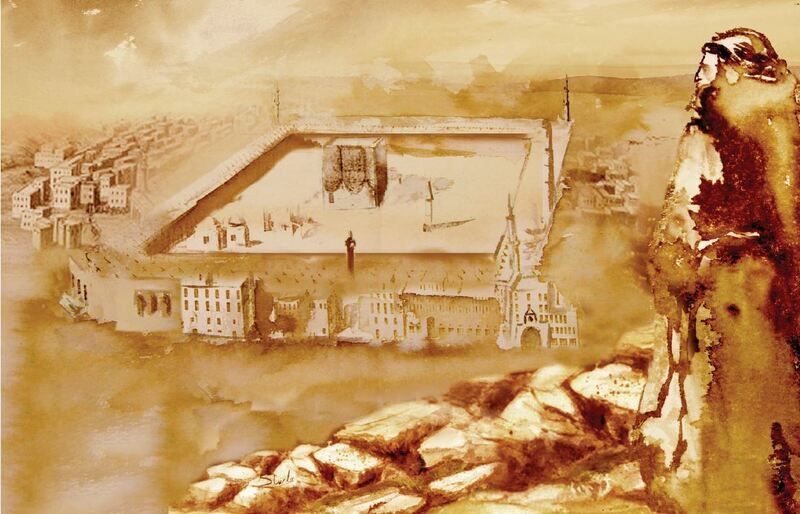 To seek expiation of his sin—and perhaps to make a hasty exit from the court—this otherwise most pious Muslim scholar set out to fulfill one of the five pillars of Islam by making the long pilgrimage to Makkah. 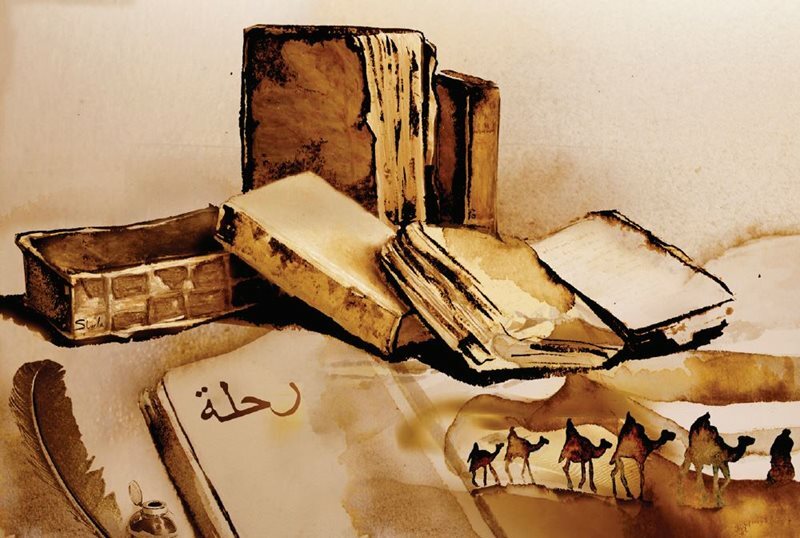 No matter Ibn Jubayr’s true motive, his two-year journey made a considerable impact on literary history. His account of his travels and tribulations in the East—which makes no mention of the wine incident—served as the foundational work of a new genre of writing, the rihla, or the creative travelogue: a mix of personal narrative, description, opinion and anecdote. In following centuries, countless people emulated and even plagiarized him. What could have moved so many people from Al-Andalus and the North African Maghreb to undertake dangerous journeys to faraway lands, particularly those people as well heeled and comfortably accommodated as Ibn Jubayr, who had received the traditional education of the sedentary elite of Al-Andalus, trained in both religious science and belles lettres? Faith, to answer the question most simply. “For Muslims, pilgrimage rituals are something of the sublime,” Ibn Jubayr wrote, thus setting a religious context for all the places and monuments he saw during his nine-month stay in Makkah and along his roundabout travels there and back. As an additional incentive, such a journey granted the esteemed title of hajj to whoever completed the pilgrimage. In the case of his being from the Arab West, he gained additional status by obtaining an ijaza, or religious teaching license, at the feet of scholars from the Arab East. Ibn Jubayr, however, had an even more personal incentive: finding his family origins. Born in Valencia but descended from the great Arab lineage of Kinana, from the region of Makkah, in some ways he was going home. 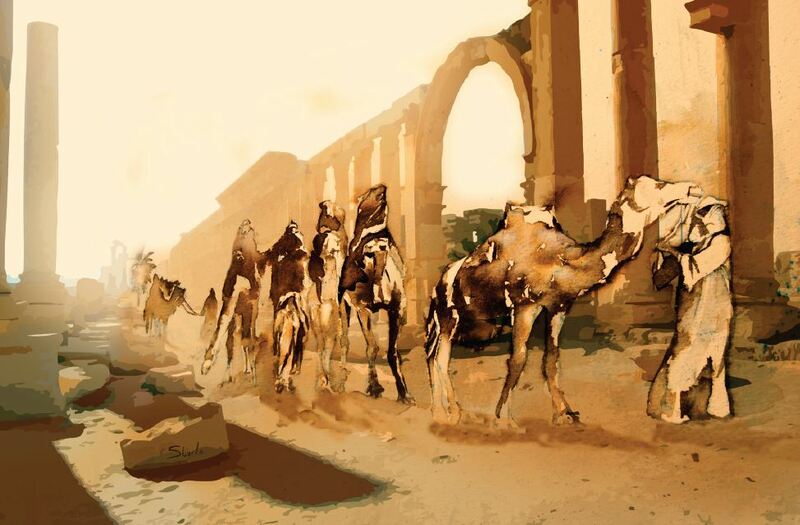 Still another reason may have been of a literary nature: He was fascinated by the desert world and by the romance of travel by caravan, thanks largely to the potent imagery in the Arabic poetry he learned as a boy. Ibn Jubayr was 38 years old when he left Granada on February 15, 1183. He moved first to Ceuta in North Africa to embark for Alexandria aboard a Genoan boat. His first act upon reaching Cairo was to stand before tombs of the Prophet Muhammad’s followers. 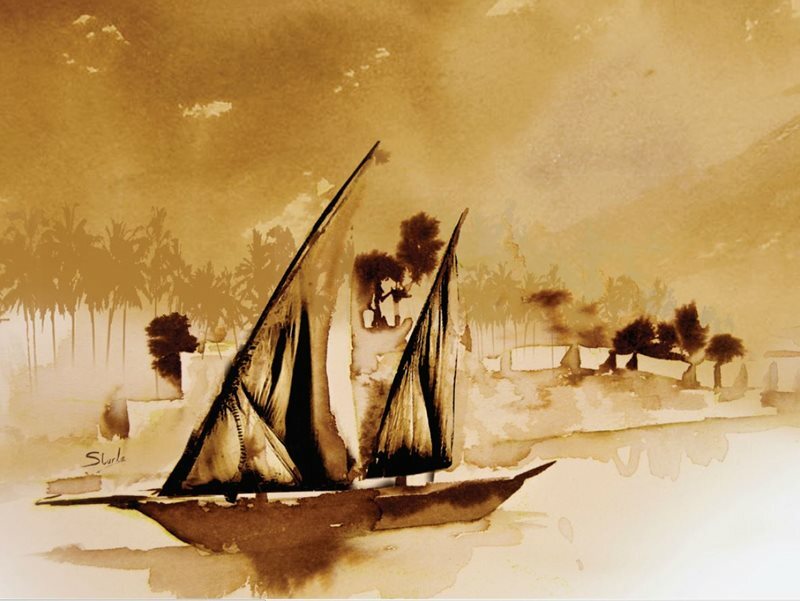 Next, he went up the Nile by boat to the town of Qus (near modern Qena), from where he mounted a camel to ride to the Red Sea port of ‘Aydhab, near the modern Egypt-Sudan border, and from there sailed across the Red Sea to Jiddah. In August he arrived at Makkah. For his return journey, he joined a pilgrim caravan that stopped in Madinah. In circular, even backward fashion, he crossed the deserts of Hijaz and Najd in the direction of Baghdad, heading east and north. There, in the Abbasid capital, he praised “the natural goodness of its air and waters,” but he complained about the vanity of its people. He returned through the fertile lands of Mesopotamia, through Mosul and west toward Syria, via Aleppo. The city of Damascus, where he remained two months, dazzled him: “Paradise of the Orient,” he called it. He then took the road to the Mediterranean port of Saint John d’Acre (‘Akka), still occupied by a Crusader army, intending next to travel into western lands. When the winds again turned, he set out for home, and he disembarked back in Al-Andalus, at the port of Cartagena. He arrived at his house in Granada in April 1185. There, he set about to write down his story. Ibn Jubayr offered suggestive images of the lands he traversed, drawing the landscapes, cities, villages and markets with an astonishing attention to detail. Once home, he surely enjoyed increased authority as a returned scholar and pilgrim, yet what he did next is not recorded. Four years later he returned to the Arab East, although his rihla of his first sojourn makes no reference to these later two years of travel. When he was 72 years old, he undertook his last trip, passing through Makkah, Jerusalem and Egypt, where he died in Alexandria on September 29, 1217. The rihla and two poems are all he left behind. Ibn Jubayr’s epic story constitutes one of the most valuable testimonies about the eastern Mediterranean world in the late 12th century, which had recently been turned upside down by Crusaders in Syria and Palestine as well as by the Norman invasion of Sicily and the fall of the Fatimids in Egypt to the rising Salah al-Din Yusuf ibn Ayyub, or Saladin. With a writing style concise if at times pompous, with alternating citations of Qur’anic verses, brief, fervent prayers and lines of poetry, Ibn Jubayr offered suggestive images of the lands he traversed, drawing the landscapes, cities, villages and markets with an astonishing attention to detail. His exhaustive descriptions of mosques, tombs and other monuments are still of great help to archeologists and art historians today. His journey also makes modern readers wonder about the climate of fear along the maritime and land routes of his day. He wrote, for instance, of a traveler’s defenselessness in the face of pirates and covetous customs officers, corrupt traders and confidence men from all corners of the world, as well as Kurdish, Arab and Beja tribesmen always at the ready to assault and rob pilgrim caravans. Ibn Jubayr’s rihla helps modern readers understand the complexity of the direct encounter between the two worlds of East and West—Islam and Christianity—that until then had been seeing each other more slantwise from across the sea, glimpsed from the corner of the eye. He explained how these two civilizations first quarreled, then learned to accept one another and finally lived warily together, all within a single lifetime. The second Crusade, after all, was launched in 1145, the year of Ibn Jubayr’s birth. Although he offered pro forma insults of other monotheisms, as was expected for his time, as well as denunciations of the various schisms within his own religion, he made his story accessible to all, for instance by providing both Islamic and Christian dates for the various legs of his trip. Ibn Jubayr would be pleased to know that his manuscript was first edited and published by a westerner, and that the earliest known copy is in a library in the West, at Leiden University in the Netherlands, and it has since been translated into Russian, Persian, Urdu, Italian, French, English, Spanish and Catalan—the latter two languages of his Iberian homeland. He was appreciative similarly of the European ships that carried Muslim pilgrims to their own holy places without interference, fearing bad weather more than militant unbelievers. Throughout, he praised the thriving Christian communities in Islamic lands and the similar Muslim communities in Christian lands. He was certainly self-effacing—never once writing in the first person—and he left much room for self-doubt and contradiction, and more often than not he addressed his own idle curiosities over matters of state. He explained the religious quandary he felt about this encounter between competing monotheisms, relating the religious fervor of his time in a personal voice when writing of his own pilgrimage to the land of many religions’ prophets, saints, preachers and ascetics. Remember that Ibn Jubayr was educated under the Almohad dynasty, whose mission was to reform and revive Islam. Educated in the Maliki school of law, one of the four orthodox juridical systems, he nonetheless did not ignore or outrightly condemn even the most heterodox manifestations of his faith. Zaydis, Qarmatians and other rafidi—rejectors, as he called them—all attracted his curious gaze. In fact, given his Almohadite demands for correct religious behavior, he seemed to indulge even the most casual Muslims as long as they were hospitable toward pilgrims such as himself. Of the Saru Bedouin of Yemen, he wrote, “the religious laws do not direct them in their affairs, and you will find among them no devotional practices beyond that of good intention.” For him, that was sufficient—and the pleasant fact that they were eloquent in their Arabic. Ibn Jubayr’s rihla helps modern readers understand the complexity of the encounter between the cultures of East and West, Islam and Christianity. One might wonder which readers Ibn Jubayr had in mind when writing his rihla. He was certainly self-effacing—never once writing in the first person—and he left much room for self-doubt and contradiction, and more often than not he addressed his own idle curiosities over matters of state. Compare this with the opening lines of the Travels by Marco Polo, the foundational travelogue of western literature written barely 100 years later: “Emperors, kings, dukes, marquises, counts, knights, and all persons wishing to know ... the kingdoms, provinces, and all the regions of the East, read this book.” What Marco Polo wanted to teach others of high estate, Ibn Jubayr was ready to set to the margin. It is telling that Ibn Jubayr, despite acute homesickness when abroad, was unable to remain in Al-Andalus after his return. Perhaps it was because the Arab West at this time was facing the loss of much of its Iberian territory to Christian armies, beginning with the Battle of Las Navas de Tolosa, known to the Arabs as the Battle of Uqab, in 1212, just five years before his death. And perhaps just as likely, he saw in Saladin’s strong hand the promise that once again Jerusalem, Damascus and Cairo could be something like Palermo, “having all that you could wish of beauty, real or apparent, and all the means of subsistence, mature and fresh,” where peace, not war, prevailed.